Designed to meet most all evaporation needs of any lab, the Heidolph Laborota 4001 Rotary Evaporator can handle both simple and complex distillation of samples sizes 50mL to 3L. This compact rotavapor can help with basic distillations, production concentrations, powder drying, separating one or more solvents and crystallization. This rotary evaporator has a motorized lift with automatic stop to perfectly lower samples carefully into the heated bath, as well as a quick release flask ejector. This rotavap comes with safety features to protect users, such as nonslip safety handles on the double walled insulated heating bath, and plastic coated glass to reduce breakage and thus chemical spills. The Heidolph Laborota 4001 Rotary Evaporator is a modular system that allows users to customize to their applications needs. This compact rotovapor with its small footprint and quiet motor can be placed where it’s needed most. Large controls make this rotavapor a synch to set up speeds, and temperatures. This rotary evaporator has a temperature range of up 10 100° for a water bath and 180°C for oil, and rotation speeds of between 20-270 RPM. 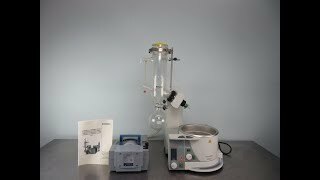 This Heidolph Laborota 4001 Rotary Evaporatorhas been tested it for functionality and it performed as expected. All of our lab equipment comes backed with our standard warranty. Should you have any questions, please don't hesitat to contact us.